One of the nice things about Joey's challenges is you can give them a try anytime. If you want to link your work to the challenge, there is no time deadline there either. I really liked the look of the tangle Gnarly for last week's challenge #119 and wanted to try it. I'm also easily distracted! I saw this YouTube video and was reminded how nice the Perfect Pearls™ powders look on black. Here is the result using a nice line stamp called Glass Vases by Hero Arts. 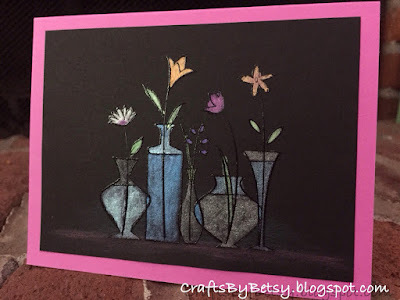 I used the same technique as outlined in the video using Strathmore ArtAgain paper, then mounted onto cardstock. 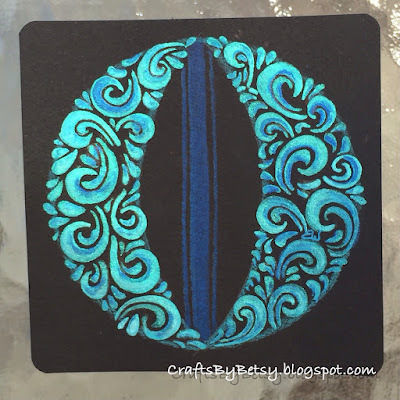 The embossing powder acted as a resist, however as I chose a fine lined stamp, I did end up going outside the lines some using the brush provided with the powders. In hind sight, I could've cleaned up those lines by coloring over the areas where I went past the line with a black marker. So, one distraction down, and a beautiful card to boot, I went back to Gnarly. When you draw it, you thicken the lines much like the results of paint strokes. I decided to try the tangle with a paint brush! 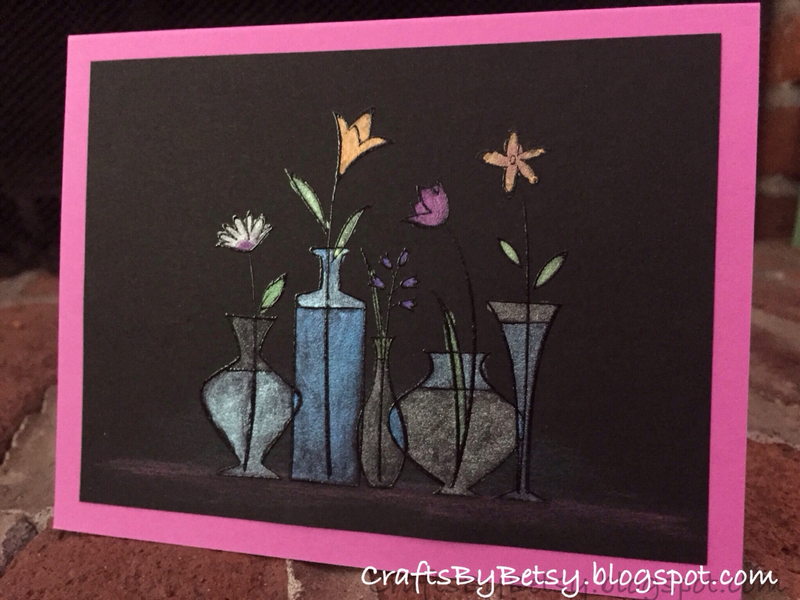 Deliberate lines can be drawn with a pen or a brush after all! My first practice attempts were using the same brush I used with the card above, the brush that came with my perfect pearls set. It just didn't work that well for me. I got out a good quality fine watercolor brush and tried again, MUCH better. I used Turquoise and Forever Blue. If I added the second color while the first was still damp, they blended really nicely. And if my strokes didn't turn out so well, I was able to redefine the black line (once everything dried) with my black Identi-Pen. I used similar blues from my Polychromos colored pencils to shade and to add the surfboard stripes. Sometimes distractions can be a good thing!